With Solspace’s expertise, the launch of BMI.com on ExpressionEngine in 2005 showed that enterprise level sites could be successfully built on EE. Besides engineering the initial buildout of the site, Solspace has created several complex add-ons to meet business needs unique to BMI. PubTools is a module that packs a variety of publishing functions into a single package. We built the interface for PubTools into a persistent tabbed footer that could be applied to EE control panel edit screens as well as front-end pages. BMI’s roster includes thousands of artists showcased on its website. With the click of a button, a function in PubTools scans publish screen content, finds mentions of affiliates, and generates links to their public page on BMI’s site. Other functions in PubTools allow editors to moderate exceptions to these automated links. A clone function allows copies of entries to be generated at specified intervals from the PubTools Toolbar. This is used for event postings. Some minor publish form display modifications round out the functionality of PubTools. The standard EE formatting buttons are placed into the PubTools footer so that they are accessible from any part of a long entry form. The categories list, critical to the workflow of BMI’s publishing, is pulled out of it’s standard location in a tab and placed at the top of the entry form using checkboxes instead of a select list. PubTools functions are managed in a module control panel that allows administrators to select what content sections (weblogs) get PubTools functions on both the front and back end. On the front end toolbar, editors are able to modify the categories that an entry is assigned to. BMI needed to closely control permissions on category assignment, and these complex permissions are also managed in the PubTools module control panel. BMI’s licensing model requires that customers answer a series of questions to determine the appropriate license. This series of questions is a sort of a tree where the answers to some questions result in another particular set of questions. For example, if your business is a bar, we want to know if it is a chain or not. The answer to that second question helps determine the correct license. BMI wanted to be able to manage this question tree from the EE control panel. Solspace created Leadgen, which is a sort of a choose your own adventure generator that gives BMI’s editors freedom to add or modify licensing rules on the fly. 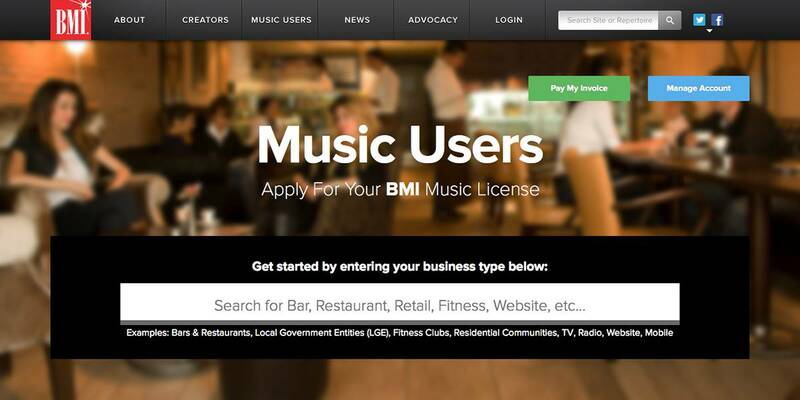 You can see Leadgen in action on BMI’s website by clicking “Licensing” in the main navigation.